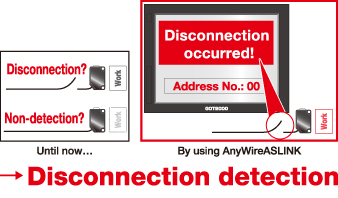 AnyWire always focuses on “manufacturing from the viewpoint of on-site” and continues to send out various proposals. 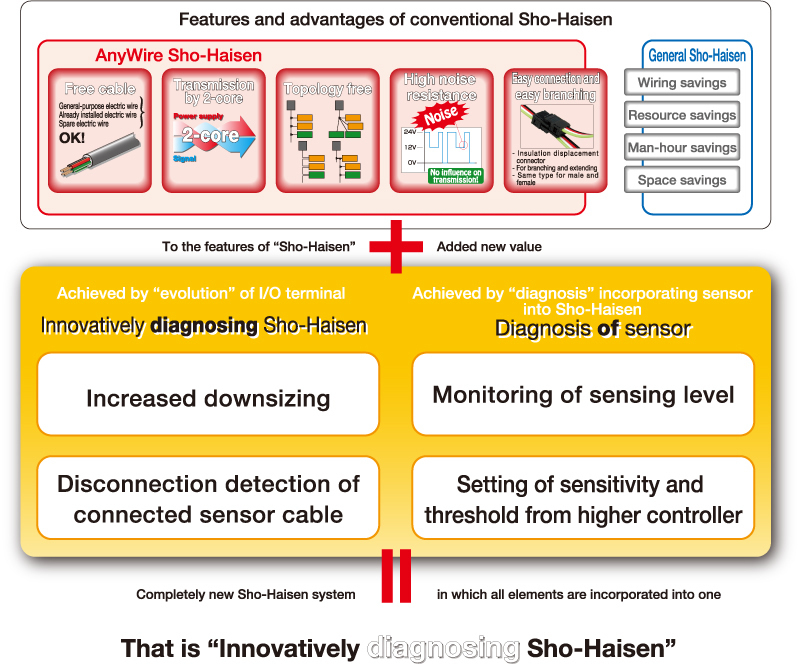 AnyWireASLINK is the breakthrough Sho-Haisen system that offers additional value in diverse ways in continuation to all of the advantages and features of the conventional AnyWire Sho-Haisen system. 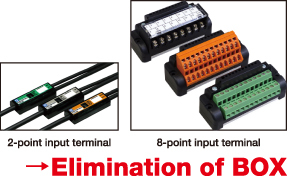 Elimination of BOX is promoted by increased downsizing including small I/O terminal of fingertip size allowing dispersion from 1-point and 2-point, and 8-point terminal of terminal block type realizing compact size of volume ratio of 1/3 in comparison with conventional types. Whether sensor non-detection? or disconnection? can immediately be determined. It was necessary for conventional I/O terminals to confirm whether sensor was in a non-detection state or whether sensor itself was in failure (sensor cable disconnection) for actual product. However, remote monitoring is allowed from higher controller and disconnected sensor is also easily identified by mounting this function. Diagnosing not only ON/OFF but also measured value. Photoelectric sensor of ON/OFF operation etc., cannot actually determine ON far from OFF or ON close to OFF. ASLINKSENSOR allowing diagnosing of measured values can monitor its state from a higher controller, therefore, it can grasp the state of the sensor. Use of ASLINKMONITOR also allows for confirmation of measured values on-site. It was common to perform sensitivity setting of sensor and adjustment of threshold one by one on-site. However, ASLINKSENSOR allows collective setting changes of all sensors to be operated from a higher position. ASLINKSENSOR can also save set values. Therefore, it minimizes downtime such as at the time of setup change. In addition, this can prevent “momentary stop” before it happens during adjustment of threshold, and can control maintenance timing.